bike, but it might get it back. 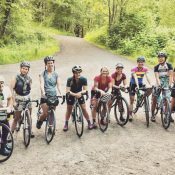 Across the river in Vancouver, police, a bike shop and a local bike advocate sat down over beers and came up with a smart, simple, free program to help recover stolen bikes. 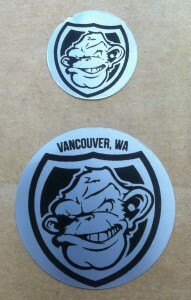 Here’s how it works, starting this month: When you buy a frame from Bad Monkey Bikes in Vancouver’s Uptown Village area, Bad Monkey enters your bike’s serial number and contact info in their database and applies a special “Monkey Shield” sticker to show that it’s done so. “When the police or C-Tran or any department recovers a bicycle and it has that Bad Monkey sticker, then they know it’s registered and know to call me,” shop manager Wade Leckie said Thursday. 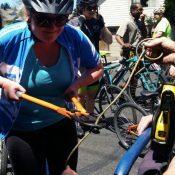 Not only is this a way to help respond to bike theft, which is going strong this year (and if you haven’t seen it, here’s BikePortland’s quick guide to preventing and responding to theft), it’s a nice example of a simple service a local shop can offer that web-based competitors can’t. Leckie said he’s rigged the system into his shop’s Quickbooks point of sale software, entering the bike’s serial number in place of an “alternate phone” so he can search by serial number. The concept is the brainchild of Vancouver Police Department Cpl. Drew Russell, Leckie and Eric Giacchino of education and advocacy group Bike Clark County (a group that’s all the more committed to helping bike theft victims after it was hit by a major theft last year itself). I dont think a sticker of a monkey with a shield implicitly signals who to call to report the bike stolen. 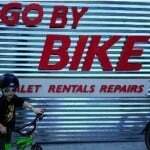 Especially if said bike is no longer in the Vancouver area. Not a great system! You’re absolutely right! Let’s not try anything and see what happens! Is there some reason this sticker couldn’t be peeled off? Good question, Erinne. I think the answer to this and Kittens’ concern, above, might be related. I operate a bike repair business in another part of Vancouver, and have been recording bike serial numbers on repair tickets for a few years now. I’m not perfect, but the serial number of most bikes I work on is on the repair ticket. It’s not a hard thing to do–there’s already brand, model, and color spots on the ticket and I’m filling those out already. What exactly is this offering that web-based registries don’t? The national bike registry is checked by police departments and bike shops across the country, and also provides a tamper-resistant frame sticker that cops and bike shops know to look for. It seems more sensible for bike shops to register the bikes they sell with a national registry, rather than teaching police to contact him whenever they find a bike that happened to have been purchased at his shop. You don’t have to have purchased a bike there to get in the registry or get a sticker, the stickers are the kind that will take the paint off if removed (place them carefully! ), and it the service is one other thing that should be done IN ADDITION to the national registry: any extra documentation that can be provided to the police is one more thing they have In their arsenal to recover your stolen bike.